On Tuesday, January 15, 2019, the New York Rangers and the You Can Play Project teamed up to celebrate Pride Night and spread the message of acceptance and respect within the hockey community. 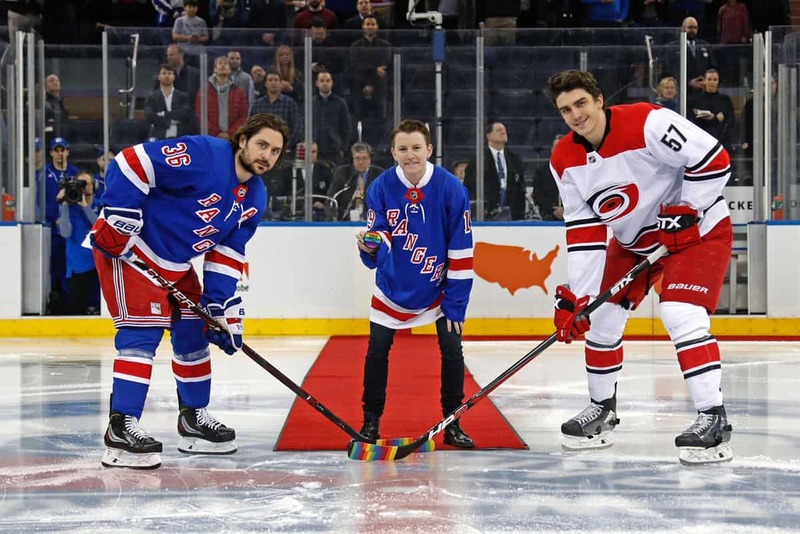 The New York Rangers welcomed Harrison Browne, the first transgender professional athlete, to their Pride Night home game at Madison Square Garden versus the Carolina Hurricanes. Harrison was given the honour of dropping the puck before the game while dawning a custom number 19 ‘Browne’ Rangers jersey. The night was a roaring success, both on and off the ice. While the New York Rangers made quick work of the Carolina Hurricanes, Harrison was raising awareness and changing lives in the stands and on social media. The impact Harrison made was clearly grand from the hundreds of responses he got online, but a Tweet from the user @AlexNYR20 summed up what Harrison’s appearance meant to the LGBTQ2 community. Since Harrison’s retirement from the National Women’s Hockey League, he’s been a trailblazer and pioneer for LGBTQ2 rights. He has been speaking to audiences across North America to share his story and to teach us how we can improve as a society when it comes to sports culture, diversity and inclusion, LGBTQ2 issues, and health. Make sure to follow along with Harrison’s journey on his Twitter and Instagram pages, and if you’re interested in bringing him in to speak with your team, office, etc., you can reach the Talent Bureau team day or night by clicking here. "Never be afraid to be yourself."